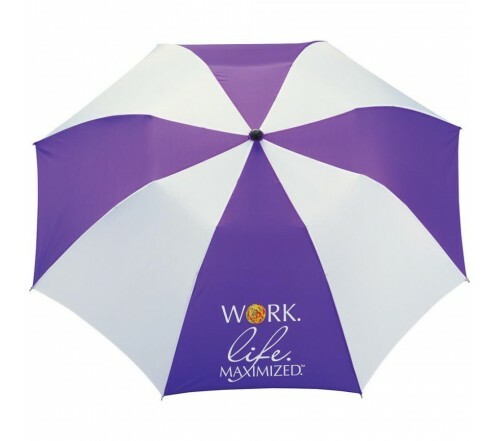 Personalized purple & white 42” arc printed umbrellas are hot and trendy in any season. Purple and white –wield strong influences when used in composition and juxtaposition. Marketers who have had moderate success with their business gifts are largely ordering logoed promotional purple & white 42” arc printed umbrellas they know that people will be happier to receive it and treasure it, too. Custom purple & white 42” arc printed umbrellas are largely used by individual businesses, family businesses and small budget business for promotions during festive seasons or during special occasions. Features- ergonomic matte black plastic handle with wrist wrap, 2 sections folding metal shaft, and purple-white matching canopy with matching color case. Dimensions – 42” arc closes to 15”. Imprint area - 6" H x 6" W.